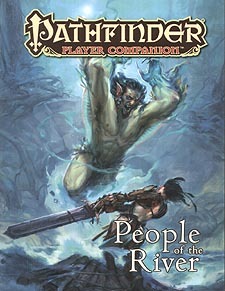 You won't get lost if your follow the river, and Pathfinder Player Companion: People of the River will be your guide! Whether your character is a Kellid warlord intent on reclaiming his ancestral homeland or a Riverfolk sneak looking for her next score, this volume has you covered. In addition, this Pathfinder Player Companion features expanded details and new rules connected to the science-infused barbarian nation of Numeria and the chaotic realms of the River Kingdoms, making it the perfect resource for Pathfinder RPG players diving into the Iron Gods Adventure Path of Pathfinder Modules: The Emerald Spire Superdungeon! Six new class archetypes, including the resourceful galvanic saboteur for rangers, the vengeful Numerian liberator for barbarians and the fickle hag of Gyronna for witches. Over two dozen new character traits, making it easy to connect the background stories of countless new characters to the nation of Numeria or any of the River Kingdoms. A beautifully illustrated explorer's map of the Inner Sea region's most storied waterway the Sellen River. Details, suggestions, and new campaign traits for characters getting started in the Iron Gods Adventure Path. New feats, spells, magic items, and so much more to ready your adventurer for the dangers of rivers.